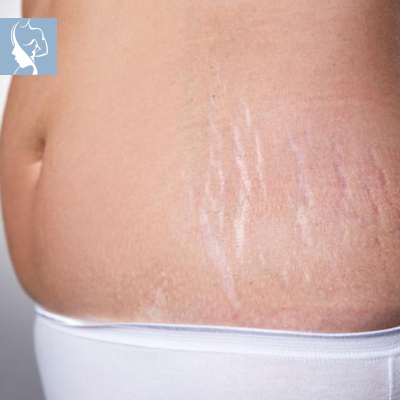 Stretch Marks are a form of scarring caused by the tearing of the dermis which appears on the surface of the skin in long streaky lines, initially coloured from pink, or red, to purple, but usually fade to whitish or silvery shades over time. Usually slightly raised at first, they may even out in time, and become less noticeable, but will never disappear completely. Their causes are often associated with rapid stretching of the skin, due to pregnancy, weight gain or loss, and growth spurts. Other factors that may influence their occurrence could be hormonal changes during puberty, or bodybuilding, and Hormone Replacement Therapy. Stretch Marks can appear anywhere on the body but are most likely to manifest in areas with greater percentages of fat storage, such as the abdomen, upper arms, breasts, hips, buttocks, back and inner or outer thighs. Stretch Marks are not a health risk, nor do they interfere with normal body functioning.